Dress by GOAT in a trendy length. 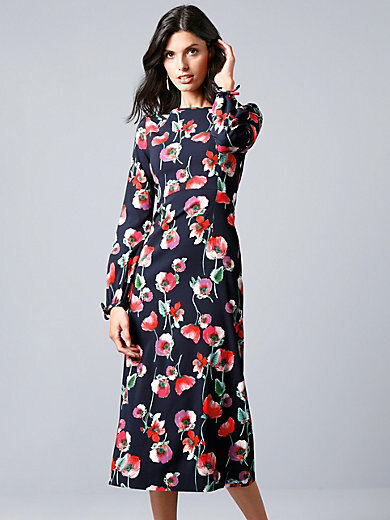 Elegant and comfortable, made from exquisite, flowing elasticated material featuring fascinating vibrant floral print that means every dress is unique. Masterful cut with a waist seam and long, slightly flared skirt for a charmingly slender, feminine silhouette. Long sleeves with little ties at the cuffs, a boat neckline and a seam zip at the back. 97% viscose, 3% elastane. Length approx. 123cm/48.5ins. Dry clean recommended.